Coquitlam is a city located in the Lower Mainland of British Columbia, Canada, it is a suburban city and is the 6th largest city in the province. Coquitlam is home to a lot of different residents and commercial properties. People in Coquitlam love the place for the weather and the overall beauty of the city. 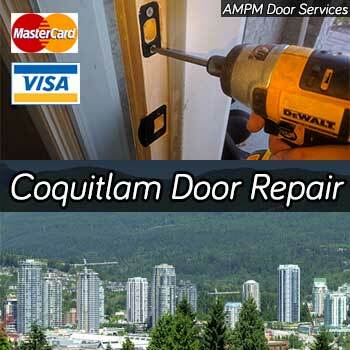 Since there are properties in Coquitlam area, there is a need for residential and commercial door repair services and this is where we come in. There are many residential properties in Coquitlam area and all of these properties have doors. Therefore, these residential properties might need a door repair every now and then. It is only common habit and nature for the doors of these properties to wear out more often than not and this is where we come in. We provide round the clock solutions to residential wooden and steel doors. We fix broken door frames, we provide paint job services and we work to install new sliding and patio doors as well. As a company that specializes in door repairs, we have a solution for any and everything. Just as there are residential properties in Coquitlam, there are commercial properties as well that need a fix. This is where we come in. We provide same day door repair services for your storefront or office. If your commercial property needs an immediate fix, we are more than willing to lend a hand in fixing your properties’ doors. We are a company that has a solution for everything so if your commercial property has sort of worn out with time, especially its aluminum and metal doors, we are just a call away. You can call us for sorting out any door related issue against your property and we will make sure that your property gets fixed immediately. As a door company, we not only provide emergency services but we also provide round the clock services. This means that we are available 24 hours a day and can be of help in case there is a need for an immediate door fix. 24hr Door Repair is a company that wants to make sure that our customers are satisfied and that is why we work to bring this to the table - we want to provide services that our customers can remember.